In honor of my espresso machine being fully plumbed in (water supply and drain line!) it’s time for another coffee hack. 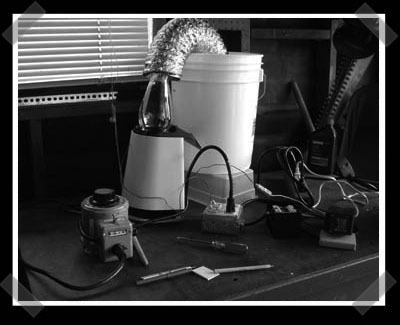 When I wrote my basic coffee roaster how-to, I seriously thought that I’d never see anyone do this, but  installed a programmable PID controller on his popper coffee roaster setup. This particular PID can be programmed to ramp the temperature over time to create an actual roasting profile, rather than manually adjusting the set points. The original page was here, but I had to pull it out of the internet archive. I am going to have to give that a whirl. What a nifty setup. Coffee roasting is a great way to save money and get the best flavors in your morning cup. I was looking at the “jiffy pop” setups for roasting coffee, but maybe a more automated approach would be ideal. Hmmmm…. great hack. there should definitely be a lot more coffee hacks. Jack Ward: you can do anything if you have the determination to – just give it a go and you’ll be surprised by how easy it is. This is a cool hack. There ought to be more coffee hacks, then we could use the resulting good coffee to stay awake and make even better coffee hacks, and the cycle repeats.